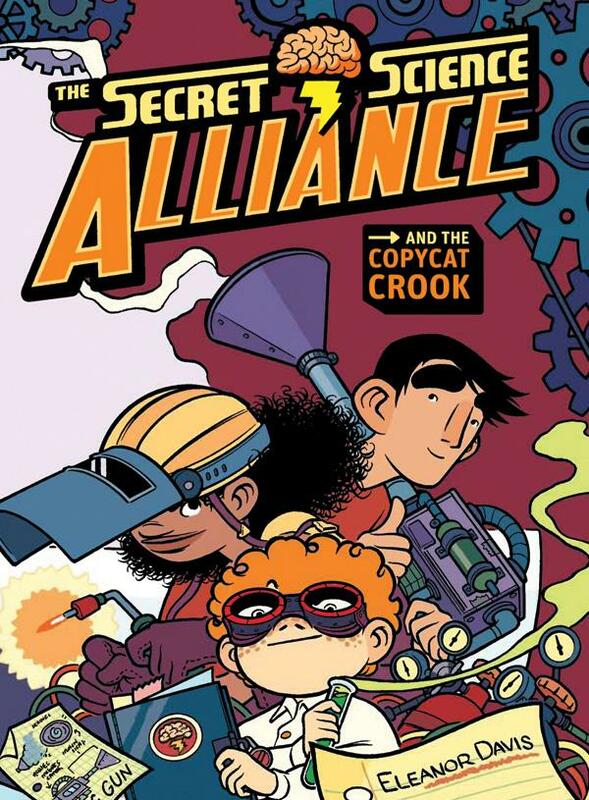 Try telling someone the best thing you read all year was a children’s comic book called The Secret Science Alliance and The Copycat Crook and watch how quickly you become telepathic. In the twenty or so times I’ve mentioned this to people since 2009, I swear, I can actually hear, “who’s this ding-a-ling” pulsating out of their brain. Four years later, I’m still that same dame-a-ling, but I’m also still that impressed with Eleanor Davis’ astonishing kid’s adventure comic that, apparently, everyone except the good people of the Illinois State Media Library (who gave it their Bluestem Award) dismissed simply because it was a kid’s comic. Doesn’t matter. I still maintain that it was not only the best comic of 2009, it was one of the best of the entire decade. A small but dense story involving three middle-school braniacs, Julian, Greta and Ben, who form a club dedicated to using science to better the world (combating evil turns out to be a by-product of their genius), Secret Science Alliance falls more into the lower-key type of adventure stories that I remember so fondly from when I was a middle-schooler. This is, pure and simple, a neighbourhood mystery that takes place in a world that you pretty much recognize as your own, populated by people that you, for sure, have met before. Nobody is just good or bad, they’re both, and even the vilest of them is just a little sad, a little envious and a lot lonely. More Encyclopedia Brown or This Can’t Be Happening At Macdonald Hall! than Harry Potter or The Hunger Games, more Degrassi Junior High than Degrassi: The Next Generation. Admittedly, Secret Science Alliance skews slightly younger, but in terms of tone, it doesn’t really have a mean bone in its body precisely because Eleanor Davis knows that not everything has to be “edgy” or “high-concept”, and that sometimes it’s okay to tell a gentle story for kids. A few years ago, I fell head-over-heels in love with Eleanor Davis’ comics. With an artistic voice distinctly her own, she wove her own modern folk tales into a series of beautiful mini-comics and shorts, each more compelling and ambitious than the last. Filled, oddly enough, with a whimsical sense of foreboding, these dark little gems dodged and weaved around your brain like spritely will o’ the wisps. And, although always delicate and graceful, you somehow always came away from them deliciously troubled. But not one of them prepared me for the tiny epic of The Secret Science Alliance. There are pretty much two ways to tell stories in comics. The first uses the panels like a movie camera, where the world is seen through dynamic long, medium and close-up angles. It is a perfectly straightforward, more narrative-centric method of telling a story, mostly utilized in genre-driven works for maximum impact in the reading experience. It’s more like present tense. The second, more daring “past-tense” technique, embraces the language of comics, and engages the uniqueness of the medium. It’s not afraid to break the narrative from time to time in order to explore different methods of storytelling and craft. Thought balloons (oh, how I miss you), establishing captions, creative page design, complex panel layouts that don’t just seem like a more polished storyboard and varied representations of time and space; Secret Science Alliance employs them all. It lives and breathes comics and, best of all, it absorbs and repurposes its very topic into its storytelling. Like a Chris Ware comic for kids, Eleanor Davis throws everything “science” and the kitchen sink into her book; dissections, cross-sections, maps, flowcharts, instructions and blueprints. None of it feels out of place or show-offy, and it’s always in service to the internal logic and thematic parameters of the story. In her shorts, Eleanor Davis’ lines are jagged and calligraphic in nature. Her colours, are delicately blotchy. In Secret Science Alliance, her linework is exquisitely controlled and rounded, and the colours are almost pregnant with weight. You can read the book at a normal pace, or you can take the time to explore, because each page is crammed with information that doesn’t just propel the story, but fills it in around the edges, too. With twenty jokes to a page, and sometimes a hundred in a single panel, the pleasure of the comic, then, evolves beyond the story and characters and expands into the discovery of little details. It’s like reading a really precisely drawn Sergio Aragonés comic. And you just love spending time with Julian, Greta and Ben. You’re right there with them as they confront some false preconceived notions they may have about themselves, learn a bit of humility, a bit more self-confidence, and most of all, discover how to get their heads out of books and be real friends with each other. They’re sweethearts, and you wish you could hang out in their club and share their secrets, and you also kind-of wish you had half the brains that they do. Secret Science Alliance has everything you ever wanted in a teacher but so rarely got; exuberance, stimulation and the love of possibility. It treasures the romance of learning, and is the absolute antithesis of a dry classroom. Whoa, mama, do I love this book! How can you not when the answer to the age old question of how many scientists it takes to change a light bulb is right there on page 67?!!! Previous PostShipping March 20th, 2013Next PostNEW IN STOCK: Punk / Post Punk Goodness!